Jeffrey Brown is a Chicago cartoonist known for his autobiographical comics such as Clumsy and Funny Misshapen Body as well as humorous comics like Cats Are Weird and Incredible Change-Bots. 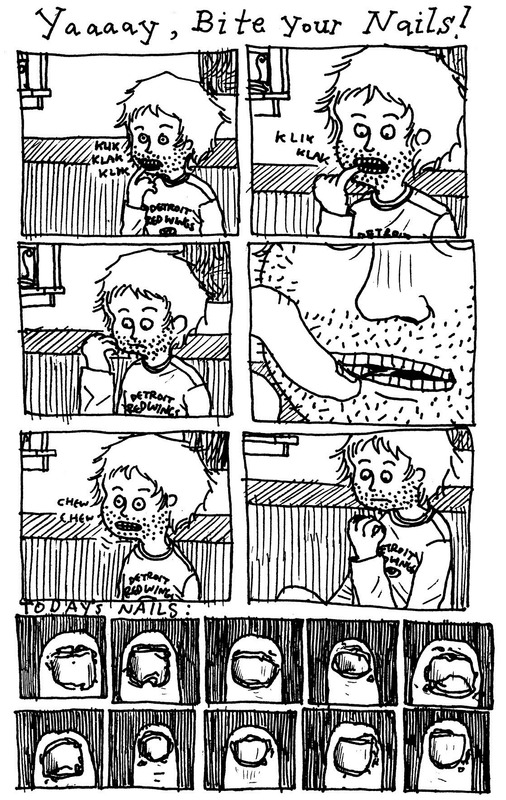 He is currently working on his next graphic memoir for Top Shelf, and despite quitting for a few months in early 2006, he continues to bite his nails. “Yaaaay, Bite Your Nails!” was originally published in the collection Miniature Sulk. Find out more about Jeffery Brown at Top Shelf Productions here: http://www.topshelfcomix.com/jeffreybrown. This entry was posted on May 30, 2011 at 12:00 am and is filed under Jeffrey Brown, Junk 3: Spring 2011 with tags autobio comics, autobiographical comics, Cats Are Weird, Clumsy, Funny Misshapen Body, graphic memoir, Incredible Change-Bots, Jeffrey Brown, nail biting, Top Shelf Productions, Yaaaay Bite Your Nails!. You can follow any responses to this entry through the RSS 2.0 feed. You can leave a response, or trackback from your own site.